Specialist presents works and days by Michael Milano, an exhibition of new works in which the labor of the hand and movement of the sun are inscribed onto cloth. Over the course of weeks, Milano hand stitches elaborate patterns along the warped matrix of underlying printed cotton broadcloth, turning a stretched fabric into a drawing space. These surfaces are then coated with photosensitive chemicals and, with the emergence of the sun, turned into photographs. 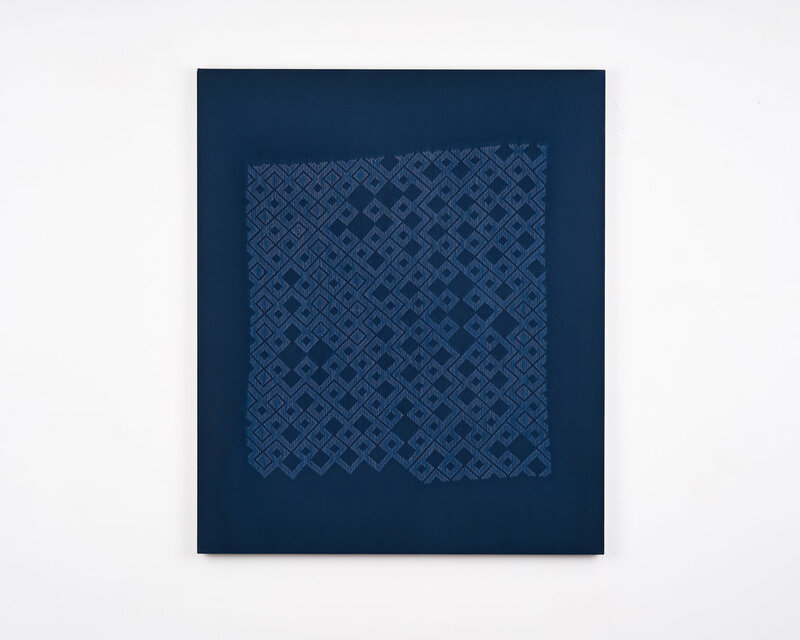 After their exposure and the threads’ removal, Milano’s self-described “stitch resist cyanotypes” transform surface into archive, creating both an artifact and direct print. They become a picture of fabric, replete with disintegrating edges and shifting patterns, sewn with a phantom thread. Bringing together global textile traditions of stitch resist dyeing and embroidery samplers, Milano’s application of a photographic process serves to historicize stitching, hand work, and textiles. Simultaneously, the cyanotype––also known as a blueprint––invokes a schema or plan, acting as an image of a proposed future. Pointing in two temporal directions, Milano’s work walks ahead while looking back; pushing, pulling, stretching and shifting, yet carving out a quiet spot in the present. Gallery hours: Saturdays from 12 - 4 pm & by appt. Michael Milano is an artist, writer, and curator living and working in Seattle. He earned his MFA in Fiber and Material Studies from the School of the Art Institute of Chicago (2009), and his BA in Humanities from Shimer College (2006). He has shown at museums, galleries, and alternative art spaces in Chicago, New York, Oakland, Toronto, Pittsburgh, Singapore, and Japan. His writing has appeared in Surface Design, Textile: Journal of Cloth and Culture, Women Artist Zine, and Bad At Sports.